xCommenter is a powerful SEO WordPress plugin that will post unique (spun) content to your posts and pages and pings all the major RPC + search engines after the comments are posted. This will add unique content to your pages, entice user interactivity, and improve your SEO efforts by making your posts and page content fresh and updated when crawled by Google, Yahoo, Bing etc. xCommenter will automatically create comments on your blog posts and WordPress pages. It does this by analyzing the post title, content and tags to determine find relevant Yahoo Answers comments and questions. Optionally xCommenter will then run the content through a powerful content spinner API to make the content more original and unique to improve quality. xCommenter then can approve it’s own comments if you wish, and once a new comment has been made xCommenter will then optionally PING the updated page URL to all the RPC Ping services listed within your WordPress Admin panel, getting the updated page crawled and indexed quickly and more frequently. All of this is done on auto pilot. There are three main benefits of using xCommenter on your site. Comments posted by xCommenter are typically questions or requests for more information found on Yahoo Answers, thus visitors to your blog will be more likely to respond, often dramatically increasing user interactivity. Even if users choose not to interact they are more likely to accept your content as an authority or subject matter expert. Fresh updated content. Search engines love fresh updated content. When xCommenter makes a comment on one of your pages or posts it will (optionally) PING the RPC Pingback services found within your WordPress Admin. This will get your content indexed quickly and more frequently. Increase amount of unique content in your posts/pages. If you’re using article directories tofind content, or spun content on your pages then using xCommenter will increase the amount of content uniqueness again improving your SEO efforts by helping to reduce risk of duplicate content penalties. xCommenter is incredibly easy to set up and use on your WordPress web sites and blogs. Set up can be done in as little as 2 minutes. There is no ongoing maintenance or scheduling required to use xCommenter (other than occasional software updates and improvements). It truly is an autopilot solution. 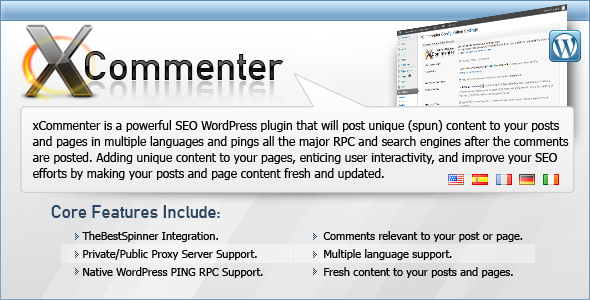 Share the post "xCommenter WordPress Auto Comment SEO Plugin"